The apartment is ideally situated on the outskirts of the medieval town of Cetona, with a splendid view over the valley and distant mountains. It is a short walk from all the local amenities, including restaurants, cafes, and shops. Within a few minutes you can be amongst the hustle and bustle of a truly Italian atmosphere with its busy piazza, but the house itself is in a quiet location. The apartment is brand new, built a year ago and is available for rent from summer 2008. It has been tastefully designed in the old traditional Tuscan style. It is on two levels, connected by a spiral staircase and accommodates 5 people in 2 bedrooms (one double and two single beds). Outside the kitchen there is a balcony, where you can eat al fresco. On the top floor there is a roof top terrace with loggia (summerhouse), where you can enjoy magnificent views over the surrounding countryside or sunbathe in total privacy. There is a shared private swimming pool that can be used by all apartments. We enjoyed it very much as we know and love Cetona and the surrounding area including all the amenities also on offer in Sarteano. 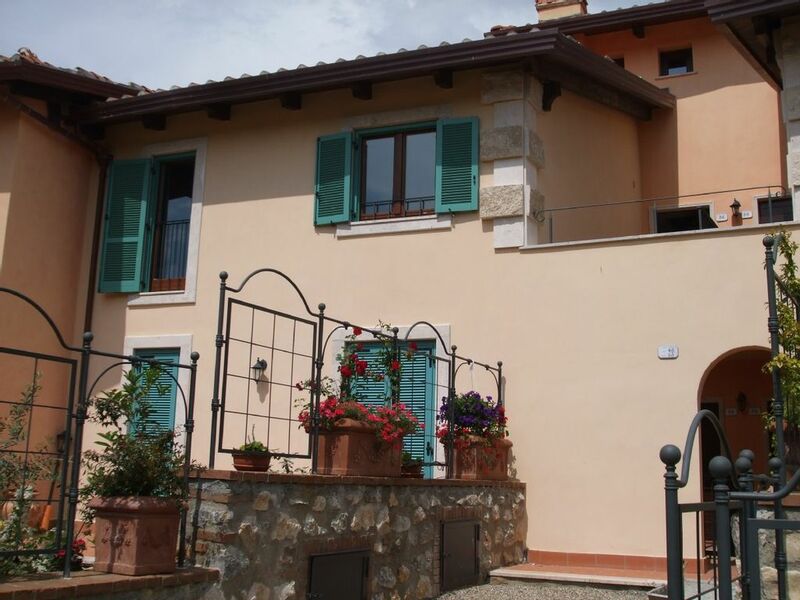 Fantastic property in a quiet development but within easy reach of the things you came to Italy for. A lovely property with superb views. The area is quiet and we often had the pool to ourselves. All amenities walkable with great places to eat and drink. Seems unbothered by tourism unlike the larger towns and has a lovely slow pace. Close enough to visit bigger centres but by listening carefully to the marvellous Lucia far more interesting experiences can be found. Super place. We will be back. Had a great 1 week stay in this spacious apartment. The kitchen is well equipped and the accommodation is very comfortable. The views over the Tuscan countryside are stunning from the windows and balcony. Absolutely loved the slow pace of life in the piazza just a 5 minute walk, where we tried all of the restaurants and can highly recommend them. A great swimming pool too, that we used daily to cool down after our sightseeing trips out. Lucia is a great host and explained everything in great detail and nothing was too much trouble. Thank you for the welcome pack of fruit etc to get us started. The apartment is in a great location to visit the many beautiful Tuscany villages. We even went to Rome for the day on the train and absolutely loved it. As it was so hot during our stay we would have welcomed air conditioning but Lucia did advise us at the very start of the holiday to close the blinds once the sun was coming through. Thank you Sophia for your communication. This was our first visit to southern Tuscany but it will not be our last. We would recommend your apartment without hesitation. This was without a doubt the most relaxing place we have ever stayed. We enjoyed the flat for a week at the beginning of our belated honeymoon and couldn’t have been happier with it. The rental is very spacious and comfortable. The kitchen is well appointed and the views are just stunning. So much so that we only dined out one night….couldn’t resist cooking fresh meals and relaxing on the kitchen deck with a few glasses of local wine. The photos do not do justice to the view, overlooking olive orchards, vineyards, and farmland. Amazing place to watch the summer storms roll through! Sofia was great to work with from the beginning, very timely in her responses. The caretaker, Lucia, was lovely and helpful. The day before our scheduled arrival she emailed me to remind me that it was a national holiday and as such stores would be closed, and offered to pick up groceries for us! She provided us with great information regarding local amenities, such as the larger shopping center off the A1 that contained a large supermarket (well stocked) and a laundry. It was a lovely surprise that Lucia brought us plums from her garden, fixings for breakfast the next day, and ingredients to make an excellent pasta dinner. Honestly, this place was just so perfect that we had to force ourselves to go out to explore the countryside. We can’t wait to stay here again. Thank you, Sofia and Lucia, for such a wonderful experience. This was our third time staying at the beautiful La Madonna as we know we are assured to have a wonderful stay. The apartment is very spacious offering a lovely cool environment in the summer but equally as comfortable in cooler months. The pool was the main draw for us and we were able to enjoy it in relative peace and quiet for the majority of our time there. Lucia is a wonderful host who met us on arrival and left a bounty of fresh produce and pasta to ensure we had something to eat on our first night. The apartment is situated within just a few minutes walk from a lovely pizzeria which I'd heartily recommend. Not much further is the town centre where there are a number of lovely restaurants and places to have an aperitivo. We hope that this won't be our last time at La Madonna. We have found that every time, there have been more and more places to visit, and more and more delicious food to be sampled! Our experience may be an anomoly however having an absent owner caused numerous challenges. The onsite caretaker (who had the key to the unit) was unbeknownst to the owner, out of town. Ultimately, we were able to reach the owner in England who stated "this has never been a problem before." We started to prepare to find a hotel until the situation could be resolved. The owner was able to reach the caretaker, who contacted the cleaning team who STARTED to clean the unit at the time we were to check in. I do need to acknowledge that the owner provided a nominal discount for our inconvenience. The cleaning team could not speak English so they asked the neighbor downstairs to interpret and provide us pertinent info on the unit. The neighbor was very helpful but we did feel we were putting her out. There is no internet access in the unit so you need to go down to one of two restaurants if you want to book tours, etc. The views are lovely, the kitchen and bathrooms are in good condition. The tile floors were quite stained which was a bit unexpected. Loved being able to walk to restaurants and the grocery store. Learn how to use an Italian coffee press beforehand as there is no traditional coffee pot. I would stay again only if the cost were reduced significantly. Cetona is a beautifully preserved medieval hilltop town, strategically situated midway between Rome and Florence. It has fine views of Monte Cetona, is surrounded by pretty hills planted with cypresses and pine trees, and has a typically medieval, circular plan centred on the crest of a hill. Recognised as one of the most beautiful medieval towns of Tuscany, Cetona has everything you need: restaurants, cafes, markets, grocery stores, interesting shops, and it's all on your doorstep. The tourist office is in the central square (the piazza) and offers maps of local hikes plus many suggestions of what the area offers. Although a vacation in Cetona typically means rest and tranquillity in a picturesque landscape, in the last few decades the area has become fashionable for all kinds of tastes: culture, vineyards, thermal baths, footpaths, monasteries, sports, excellent food, cafeterias, and numerous festivals. Note that some bookings may be flexible or provisional, so please ask even if your preferred period is shown booked! * 25% of rental fee due to secure booking non refundable. * the rest of rental fee (75%) plus refundable breakages deposit of £100 (to be refunded within two weeks of your departure and subject to satisfactory property inspection) due at least one month before the actual stay.